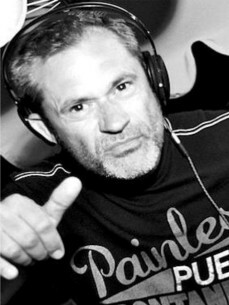 Dj and producer from over 20 years Luca Fregonese is one of the most respected club dj in Italy. His productions are club oriented and most supported by top djs, he is named “Doctor of the dancefloor”. Debut release on Distar was the lucky single "Spin your jet" under the name DJ top sales in Italy and most played to all clubs wordwide. From several years he produces and writes massive House and Electro tracks with the "partner" Felix. Prestigious goals with Distar Records achieved by the singles "Circoblanco" and "Pump Up The Volume" supported by many top DJ such as Bob Sinclar and Tara McDonald; previous single “Good Times” was licensed to Hed Kandi UK top compilations. With their latest hits "My feeling" and "Timeless" Luca Fregonese became are one of the manufacturer's most HouseTool Creator 'strongest moment! Pump up the volume!